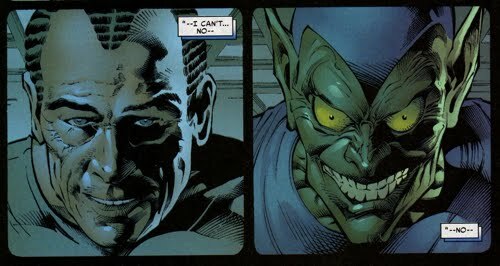 One might be under the impression that since Spider-Man helped Norman Osborn escape from prison that there would be a truce established between the two of them. But that is not how Norman operates, and even though his location after the Riker's Island escape is unknown, he continues to strike at Peter as if he had never left. 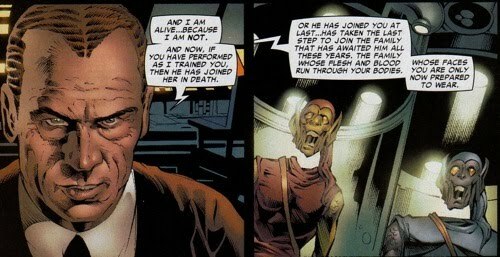 The revelations presented in the Sins Past saga have dramatic effects not only on the history between Norman and Peter but the entire Spider-Man mythos as well. 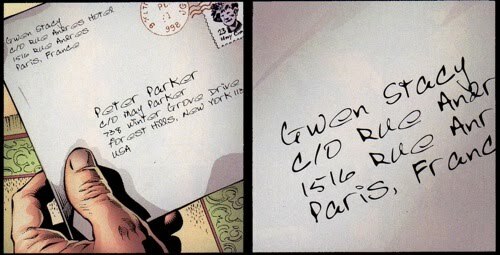 This controversial story arc begins in Amazing Spider-Man #509 in which Peter receives a letter in the mail, postmarked in 2004 (the year of the story's publication), from Gwen Stacy. There is only one page to the letter and its clear information that information is missing. Later that evening, Peter is having trouble falling asleep, so he decides to visit Gwen's grave. While there, Peter is attacked by two unknown assailants, one male and one female. Peter does not wish to reveal his secret identity as Spider-Man, so he's forced to hold back and narrowly escapes. The threats continue in Amazing Spider-Man #510 when Peter receives an envelope that contains pictures of MJ and Aunt May, with a note that says "we can kill them whenever we want". Peter takes the letter to Detective Lamont, who passes the letter on to forensics in order to figure out if something was written on the back side of the paper, which might possibly provide more insight into what is going on. Soon after, Lamont gives the letter back with the small amount of information that could be retrieved from the original letter. Shockingly, Peter discovers that Gwen was pregnant with twins, Sarah and Gabriel, and that she had secretly given birth to them. 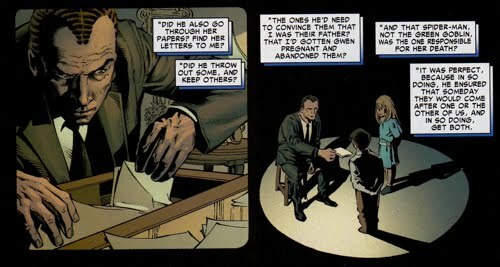 In Amazing Spider-Man #511, Peter decides to run genetic tests using DNA extracted from the envelopes to convince himself that these are in fact Gwen's children. Apparently Peter went to Gwen Stacy's grave to obtain a useable piece of DNA from her corpse. While running the genetic tests, Sarah pays Peter a surprise visit. She claims that Gabriel wants to see Spider-Man suffer and then he is going to kill him. A fight ensues and Peter unmasks Sarah only to reveal an uncanny resemblance to her mother, Gwen Stacy. Peter soon returns home and tells MJ that the tests confirm that they are Gwen's children, he goes on to say that he swears that they are not his children. 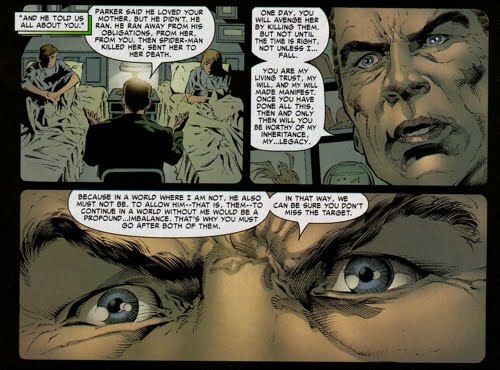 On the last panel of this issue, MJ tells Peter that she is aware who the real father is. MJ provides Peter with the full story, at least the parts that she is aware of, in Amazing Spider-Man #512. She tells Peter that Gwen confided in her in regards to an affair she had with Norman Osborn roughly 7 months before she died. MJ explains that she had given Gwen her word that she would keep this secret and not share it with anyone, especially Peter. 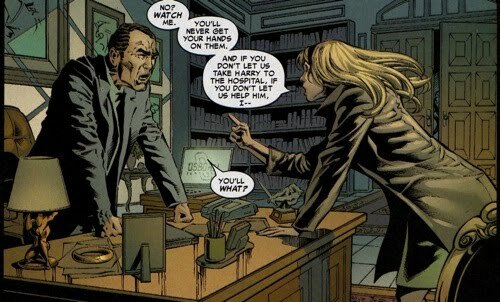 MJ had overheard an argument between Norman and Gwen just before her death, in which Norman demanded that the twins be placed under his care. It was in Norman's best interest to keep this potential scandal private, so he suggests that he could adopt the children. Gwen stoutly refuses, claiming that she doesn't want him anywhere near the children because she doesn't want Norman to destroy them the way he did Harry. She goes on to say that she will tell Peter the truth and that he will help her raise the children, since he is the only one "fit" to do so. As Gwen storms out of the room she finds MJ waiting there and she explains to her friend how/why the affair had occurred in the first place. Gwen states that she had gone to see Norman 7 months prior regarding "something else" (for more insight into the timeline see The Memories Return section). According to Gwen, she felt "so badly" for Norman but that there was a strength and a magnetism she just "couldn't walk away" from. Shortly after, Gwen had given birth to the children in Europe, where they remained. Apparently the children were born two months premature, but fully grown, certainly a strange occurrence. There was also the question as to why the children were as old as they were, the timeline didn't make sense. The answer to both anomalies: Norman's exposure to the Goblin formula. Norman’s Goblin formula, which had integrated into his DNA and provided him with rapid regenerative capabilities, had been passed down to his offspring and caused their rapid aging. 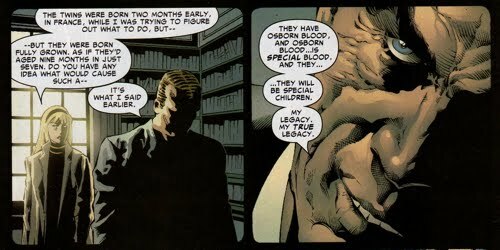 Norman tells Gwen that his Osborn blood is his true legacy. After MJ finishes telling Peter the secrets she had kept from him for so long, Peter lashes out, cursing Osborn's name and destroying his home. Peter eventually calms down and realizes that this provides Peter some insight into Norman's prior motivations including why he chose Gwen of all people to kill and why he went Europe after his “death”. Unfortunately, the twins are now dying due to the rapid aging and they need Peter’s help in order to stay alive. In Amazing Spider-Man #513 Peter holds a press conference in which he tells the twins to "meet [him] in the place where [he] saw their mother for the last time", and that place is the Brooklyn Bridge. The twins soon arrive at the bridge and they provide Peter with their side of the story. They claim that Norman was their "anchor" while growing up and that he was always there for them. Peter then explains the truth to them that Norman is the villainous Green Goblin and that he had fed the children the false information and brainwashed them. Norman had them convinced that Peter Parker was there father and that he had abandoned them and that Spider-Man had killed their mother. It is important to note that Norman never told them that Spider-Man and Peter are one in the same. Sarah believes Peter's side of the story, however, Gabriel does not and in the ensuing fight Gabriel inadvertently shoots Sarah. Peter is able to save Sarah as she is falling off the edge and he then rushes her to the hospital. 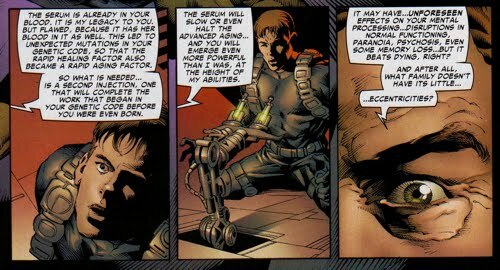 Peter gives Sarah his blood to keep her alive, meanwhile Gabriel remembers instructions he was given by Osborn to find one his Goblin hideouts. Sins Past concludes in Amazing Spider-Man #514, which picks up just after Gabriel had tracked down the secret Goblin hideout, he had memorized a map with its location. When he arrives at the hideout he finds that Norman has left a pre-recorded message for his children, a set of Goblin costume and a new formula that should help curb this rapid-aging process. In the pre-recorded message, Norman confirms that Spider-Man and Peter Parker are the same person. 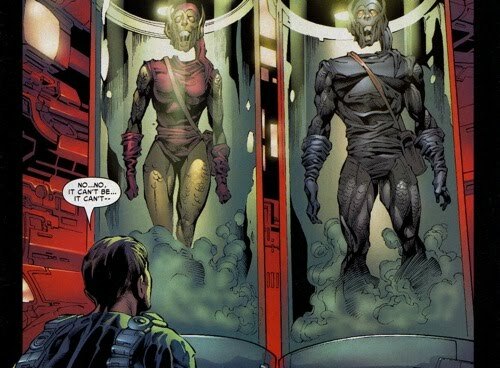 Norman also explains that the rapid-aging that they are experiencing is caused by the "serum" they inherited from their father as his legacy and its combination with Gwen Stacy's blood (let's assume he means genes) that they also possess. This "flawed" combination has caused "unexpected mutations in [their] genetic code, so that the rapid healing factor became a rapid aging factor". After listening to Norman's message, Gabriel is then convinced that Norman is his father and he then takes this new formula and dons the Grey Goblin costume. As the Grey Goblin, Gabriel attacks Peter and Sarah in the hospital, but Sarah is able to thwart her brother's attack. She shoots his Goblin glider, which then explodes, sending him crashing into the harbor. Soon after, he washes up on shore with temporary amnesia. After saving Peter, Sarah leaves, claiming that she has to "go away." The arc concludes with a nearly unconscious Peter having memories of Gwen, while MJ is holding him in her arms. 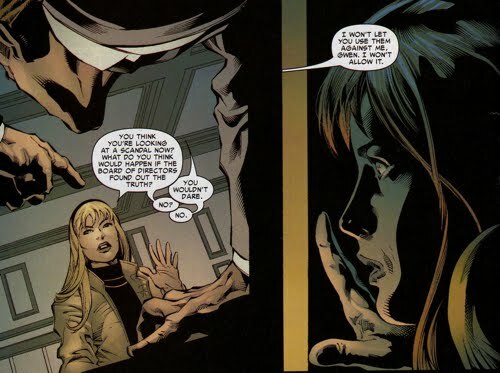 The Sins Past storyline changed the face of the Osborn/Parker dynamic forever and at the same time changed Peter's views on his former girlfriend Gwen Stacy. It will be interesting to see if this tale remains a part of continuity in future stories. One point of interest in regards to the this arc involves Norman's incarceration during the events of this story (and Sins Remembered for that matter too!). 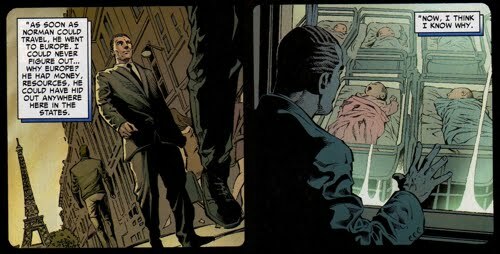 In Amazing Spider-Man #514 Norman is shown to be in jail (during the scene where the doctor asks Peter if Sarah has any available next of kin), even though the last time we had seen him he had escaped prison. 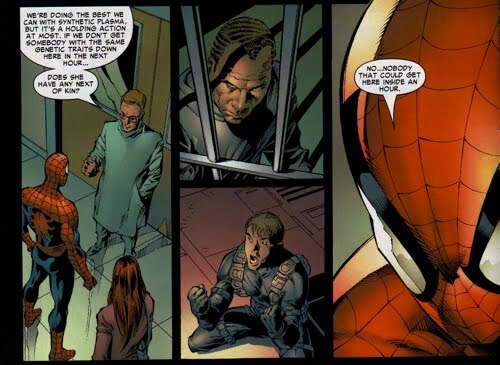 Moreover, during The Last Stand (which ran through Marvel Knights Spider-Man #9-12), Peter states that Norman was in jail for 2-3 months. Since Peter makes no reference to the Stacy twins throughout that arc, its possible that Sins Past took place after The Last Stand. Certainly Peter's demeanor throughout Sins Past and Sins Remembered does not reflect a person preoccupied with their aunt's kidnapping. This also suggests that The Last Stand took place before Sins Past. The ramifications of this interpretation are as follows; Norman was placed in Riker's Island, escaped, and was picked up again by authorities prior to the events of Sins Past. Whether or not S.H.I.E.L.D. is responsible for catching him on the second occasion or whether this is the unverified claim that "Norman was picked up in France" is unclear. The next time Norman is seen is in S.H.I.E.L.D. custody in Civil War Front Line #2, however, he could have been transferred into their custody after being detained some place else prior.